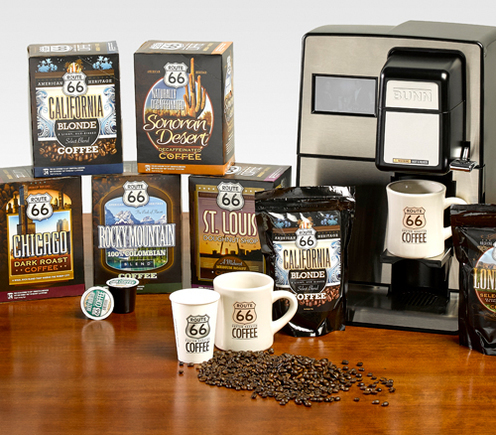 Take A Break Vending provides a full line of popular national brands of coffees, teas, cocoas, and hot beverages, along with USConnect's signature Route 66® Coffees. From rich, dark roasts to doughnut shop blends and blondes, we've got fresh, custom-roasted coffee for every taste. In addition, we can customize your water and coffee service with a wide range of stylish, efficient beverage kiosks or traditional vended coffee machines, based on your company’s needs. We're pleased to provide the very latest in coffee brewing technology—from single cup brewing systems and interactive brewers to the time-tested traditional pot brewers, liquid dispensers, and airpots. Our route service team will fully stock your coffee stations with all the needed supplies: cups, sweeteners, creamers, stirrers, flavored syrups, napkins, and any other supplies needed to perfect your cup. What’s more, once we set up your coffee service, we’ll manage and maintain it, too—our machines are cleaned at each service by your route service technician. In addition, all coffee machines are sanitized on a regularly-scheduled basis so that you get a fresh, hot cup every time. Contact Take A Break Vending today, and let us get you a cup.